1 Through personal consultations, a profile of your individual investment needs, objectives, time horizon, and attitude toward investing is developed. 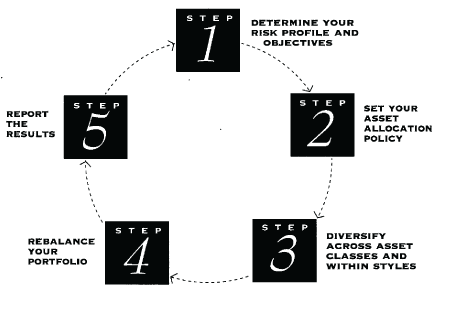 2 A personalized asset allocation and investment policy statement is then developed as identified in Step 1. This policy helps maximize your investment returns relative to your risk tolerance through the carefully diversified allocation of your investments. 3 Your asset allocation policy is implemented by investing in a well-diversified portfolio – diversified among asset classes and styles. Individual stocks, top quartile mutual fund selections, Limited Partnerships along with pre-eminent institutional money management firms may be used to accomplish your selected objectives. 4 Your investment portfolio is carefully monitored to ensure that it remains consistent with your specific asset allocation policy. If the relative value of investment in your portfolio changes enough to become inconsistent with this policy, it is rebalanced. 5 Conduct annual reviews to evaluate performance, review investment policy, and corresponding individual account allocation relative to life changes and personal preferences. Provide statements of your account(s) including total asset value and a record of all transactions that occurred during the reporting period. While asset allocation and diversification are useful tools to help help risk in a portfolio, they do not assure a profit or protect against a loss in a broadly declining market.